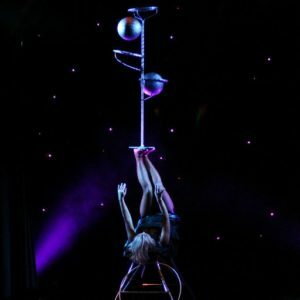 This Female Football Sensation that juggles and does tricks with 4x footballs all at the same time certainly turns MANY heads when she gets up on stage. Costs to book this Female Football Sensation start from GBP £ 550 all depending on what is required of her to do and where she needs to perform. Having this Female Football Sensation entertainment at a corporate event suddenly gets eyebrows raised. This incredibly beautiful female football entertainer has performed in front of many audiences and at many corporate events. Her special and unique football juggling show seems to be very popular at both corporate events and also dinner galas. She is one of the only football juggling female entertainers to juggle more than 3 balls at once.